(From the YMCA Website) "C. E. Buchner had a dream. He envisioned a healthy refuge for oilfield workers, railroaders and young truants from the mud roads of "Tulsey-Town." It was 1909 and the rich oil fields of Glen Pool and Red Fork lured hundreds of men to the area. Buchner, then secretary of the YMCA, organized outdoor youth programs that would become a model for YMCAs worldwide, but he longed for a permanent facility to house and feed migrant workers living in oil field "tent cities." Mindful that Aladdin's lamp was an oil lamp, Buchner turned to leaders within the petroleum industry, who responded with astounding results: Within 10 days they'd reached a goal of $100,000 and the first building was constructed at Fourth and Cincinnati, complete with cafeteria, meeting rooms, health facility and dormitory. " 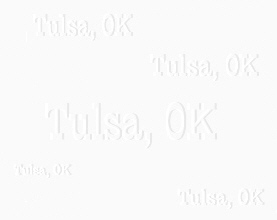 Tulsa's Y.M.C.A. building shown in this postcard is located at 515 S. Denver and is known as "the downtown Y". I can't find a date for when this building was built. 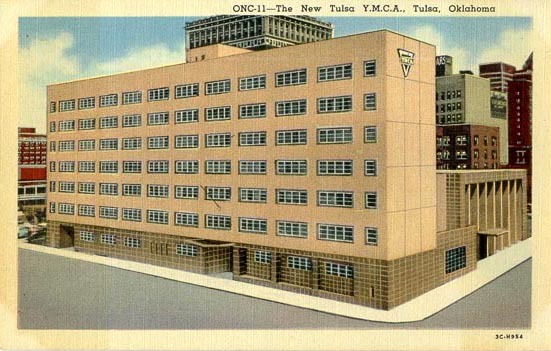 The "Y" has been many things to many people over the years, but for many Tulsa teens of the '50s & '60s this building will always be remembered for its Saturday night Sox Hops. Many of the Hops were held in the basement located just below the front window on the far right. We were not allowed to smoke in the building so the covered doorway on the right side of the building was were teens went to smoke, drink a coke and sit out a few dances (and also figure out who would take who home). This Y is still actively serving the people of Tulsa.